An impressive line-up including 25 winning, highly promising young horses, have been catalogued for the Goffs UK January Sale’s P2P/Form Horse Session which will be held on the second and final day of the Doncaster sale on Wednesday 23 January. The dedicated session made a promising start last year having been topped by the £270,000 Pointer Phoenix Way who won a Novice Hurdle for Harry Fry and JP McManus in exciting fashion earlier this month. Featured in the 2019 session is the Colin Tizzard trained 5YO MASTER DEBONAIR (Lot 256 – pictured), the winner of two of his three Bumper starts including a Listed Bumper at Cheltenham on his most recent appearance. 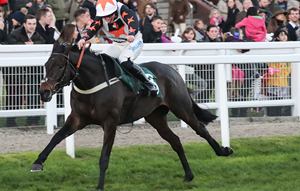 That Cheltenham form has been bolstered since with the defeated debut winner, Ribble Valley, subsequently winning impressively on his next start at Ayr last week. Lot 246, Enfant du Mou (5YO G by Irish Wells), winner of a 4YO Maiden P2P on his most recent start for Tom Ellis at Clifton-On-Dunsmore on 16 December. 250, Chance Finale (5YO G by Blue Bresil), the debut winner of a 4YO Maiden P2P for Terence O'Brien at Boulta on 16 December. 251, Lucky Flight (5YO G by Linda's Lad), a most impressive debut winner by a significant margin of a 4YO Maiden P2P for Mary Doyle at Borris House on 9 December. 253, Dream On John (5YO G by Arakan), the last start winner of a 4YO Maiden P2P for Gillian Callaghan at Boulta on 16 December. 254, Banner Rebel (5YO G by Stowaway), the impressive four-length debut winner of a 4YO Maiden P2P for Kieran Purcell at Dromahane on 30 December. A half-brother to the Gr.2 winner BALLYBOLLEY. 259, Avoid De Master (5YO G by Getaway), the three-length winner of his most recent P2P for Paurick O'Connor at Mainstown on 6 January. The Goffs UK January Sale will commence at 11am next Tuesday with a day of NH Mares and Foals with entries including a sibling to the Gr.1 Cheltenham Gold Cup winner SIZING JOHN (Lot 96) and the Gr.2 winning mare SMART TALK (Lot 161 – supplementary entry).